HMRC may collect an individual's tax debts (including Tax Credit overpayments) by adjusting their Pay As You Earn (PAYE) tax code. Until 5 April 2015 the limit for coding out of tax debts was £3,000, but from 6 April 2015 a new scale applies. Employers will be required to make additional deductions out of pay which is already subject to PAYE and NICs. HMRC is increasing the amount of debt that it can recover through a tax code if annual earnings are £30,000 or more by applying a sliding scale to main PAYE income. These changes will only apply to underpaid Self Assessment and Class 2 National Insurance debts and Tax Credit overpayments. Changes will be reflected in tax codes from 2015-16 onwards and HMRC will write to taxpayers before it collect any debts through your PAYE code from April 2015. 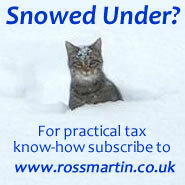 Employees can go to Problems paying HMRC or if they have any queries about their tax codes as a result of this change.